We are offering Feather fill Pillow/ Cushion with different sizes are 20"x30", 17"x27", 20"x34", 16"x16", 18"x18". Fabric: Cotton Fabric are used (120TC to 350TC). Filling: The best quality fibres, lighter than feather are used. We offer Mini Yoga Bolster. Our ranges of Mini Yoga Bolsters are a versatile prop. White Feather Fill Cotton Pillows, Size: 8"4"
India is the leading country in producing 100% Organic pillows. 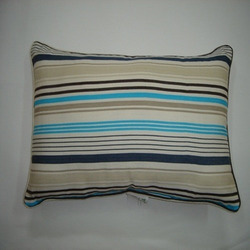 Being a well-distinguished company in the market, we are into offering Square Cotton Pillow. Our experts have designed Organic Cotton Eye Pillow for the yoga purpose. These pillows are very light in weight and extremely soft. These are used as mood tonic and headache remedy. Owing to our immense market knowledge, we are able to offer excellent quality Printed Mandala Floor Pillow. 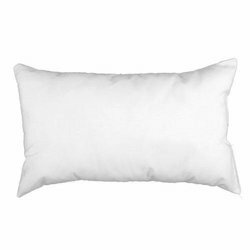 White Sleep Cotton Pillow, Size: 16" * 24"